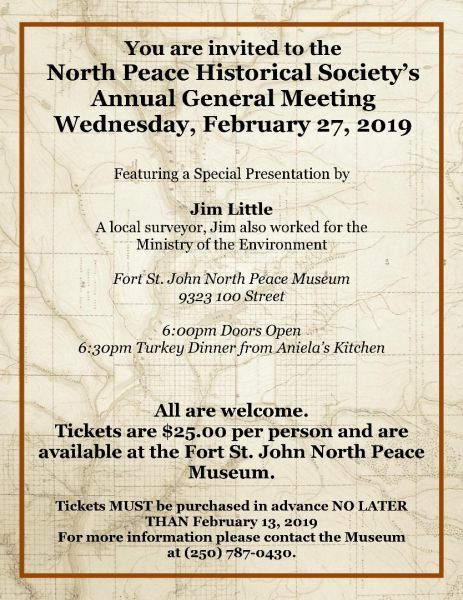 You are invited to the North Peace Historical Society's Annual General Meeting featuring a special presentation by Jim Little, a local surveyor who worked for the Ministry of the Environment. Doors open at 6:00pm and a turkey dinner from Aniela's Kitchen will be served at 6:30pm. All are welcome. Tickets are $25/person and are available at the Fort St. John North Peace Museum and MUST be purchased in advance no later than February 13, 2019.